Definition: Otitis media, also called a middle ear infection occurs when a virus or bacteria cause the area behind the eardrum to become inflamed and that is most common in infants and young children, especially those between the ages of 6 months and 3 years. 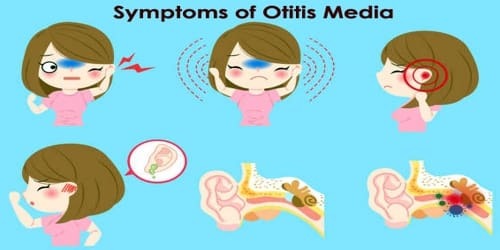 Acute otitis media (AOM)- This type of ear infection comes on quickly and is accompanied by swelling and redness in the ear behind and around the eardrum. Fever, ear pain, and hearing impairment often occur as a result of trapped fluid and/or mucus in the middle ear. Otitis media with effusion (OME) – After an infection goes away, sometimes mucous and fluid will continue to build up in the middle ear. This can cause the feeling of the ear being “full” and affect your ability to hear clearly. In general, otitis media is not serious and does not normally cause permanent hearing problems if treated properly. Most often, otitis media is cured in the home by means of medication. If people child contracts otitis media often or otitis media is not treated, it can cause permanent damage to their child’s hearing. Most middle ear infections occur during the winter and early spring. Often, middle ear infections go away without any medication. However, people should seek medical treatment if pain persists or they have a fever. Although a middle ear infection can occur at any age, it’s much less common in older children and adults. Ear infections do not spread from person to person and they most commonly occur with a cold. Antibiotics are often used to treat ear infections, but in certain circumstances, a doctor may suggest waiting for 2 to 3 days before starting antibiotics. 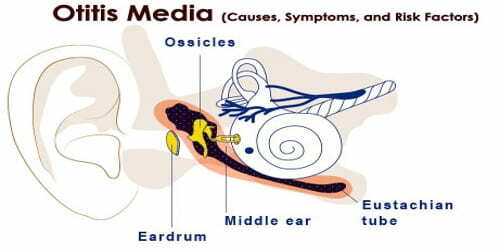 Causes, Signs, and Symptoms of Otitis media: Otitis media is caused by a virus or by bacteria that lead to an accumulation of fluid behind the eardrum. This condition can result from a cold, allergy or respiratory infection. The accumulation of fluid in the middle ear during otitis media causes an earache, swelling, and redness – which is called acute otitis media and also prevents the eardrum from vibrating properly, which typically results in (temporary) hearing problems. Age: This is the most important risk factor for developing otitis media. Season: Increased incidence during autumn and winter. Barometric trauma is another risk factor for a middle ear infection. The pressure in the middle ear rises when the airplane people are traveling on descends or when they ascend while scuba diving. 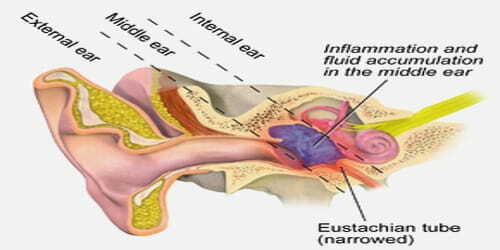 If the eustachian tube is not open, the pressure in the middle ear cannot be equalized, and thus, may cause injury, which increases the risk of an acute ear infection.